Structural plywood are manufactured to AS/NZS 2269 uses a Type A Bond to laminate the individual veneers. Type A glue bonds are durable and permanent under conditions water boiling, long term stress, and combinations of exposure and stress. Structural plywood can be manufactured with a range of face and back veneer qualities to suit the plywood use. Best veneer quality grade A is a high quality appearance grade suitable for clear finishing. Grade D is a non-appearance grade with permitted open defects. The standard face grade for T&G structural plywood flooring is “C” which is a non-appearance grade with a solid surface. All open defects such as holes or splits are fixed. The face is suitable for direct covering. The standard grade for the back of panels is “D”. The “D” grade surface can contain open defects such as knots and splits. If the backside of the flooring will be visible, a better quality veneer grade can be specified. The structural properties of plywood are mentioned in both AS/NZS 2269 and AS 1720.1 “Timber Structures Design Methods”. 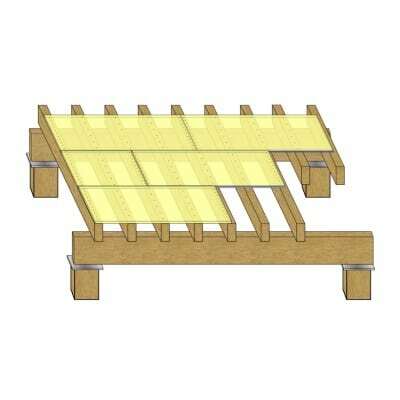 Standard structural plywood panels are readily available in two stress grades, F11 and F14. Structural plywood panels are available in higher stress grades for more highly loaded commercial and industrial flooring applications. Thicknesses are available including 15, 17, 19, 20, 21, and 25mm, however thickness availability will vary between different manufacturers and it is best to check both the thickness and panel sizes locally available before specifying the plywood.